Dramatic images show how a mother of six gave birth to her youngest child in a hospital corridor, when she arrived too late to make it to a bed. Jesica Hogan, based in Riley, Kansas, welcomed her fifth child and only son Max in July last year and has just opened up about her incredible birth story in a new video shared by her birth photographer Tammy Karin. The mother, who gave birth at the Via Christi Hospital in Manhattan, Kansas, had contractions for several days before Max's birth, without going into labor. She and her husband Travis even went to the hospital a first time, but ended up coming home for several days of waiting. Around that time, Jesica began to worry she wouldn't be able to tell when labor would actually start. 'I was losing faith in my ability to tell when I would actually be in labor, and losing faith that my body knew what it was doing,' she explained in a blog post on Tammy's website. Eventually, one night, Jesica started having contractions again but didn't think they would amount to anything. She even told her husband that she believed labor would need to be induced, or that she wouldn't realize she was in the early stages of giving birth until it was too late. 'I stayed awake contracting, yet again, until about 2 am. It was at that time that I wrote to a group of other expectant and fellow moms, complaining of those very same contractions and my fears of not making it to the hospital in time,' Jesica added. At that point, the mother felt her water break and worried that she and Travis wouldn't make it to the hospital on time. Travis, however, remained calm and drove her to the hospital around 3 am. Things happened so quickly, Jesica said, she didn't even have time to put shoes on. On the way to the hospital, the mom felt the baby moving down every time she had a contraction. When Travis pulled up to the hospital, no one came out, so he ran around the car to help his wife get out of the vehicle. 'I told him Baby was almost there. I also said I couldn't get out, I felt as if Baby was ready to emerge. That feeling made it nearly impossible to move,' Jesica added. Tammy arrived to the hospital right at that time to capture the birth. Travis, meanwhile, helped his wife walk to the E.R. and through the hospital's doors. 'I made it just past the second set of automatic doors, into the next hall, which luckily was not carpeted like the one we had just stepped out of,' Jesica wrote. 'I know at this point I said something to the effect of, "Oh God, he's here." I then started to take my pants off because I could feel my body pushing the baby's head out. 'I reached down and could feel his head crowning with my hand. I looked at my husband and said, "Travis catch him!" Nurses ran down the hall to help Jesica with the rest of the birth, helping the mother lie down in the corridor and telling her to push. 'With one more push as instructed by the nurse, and the only intentional push I gave, I felt the rest of his body come out,' Jesica said of Max. Max took a little time before letting out his first cry and was 'incredibly bruised' due to his rapid birth, but he ended up doing just fine and the family was transferred to the labor and delivery department. 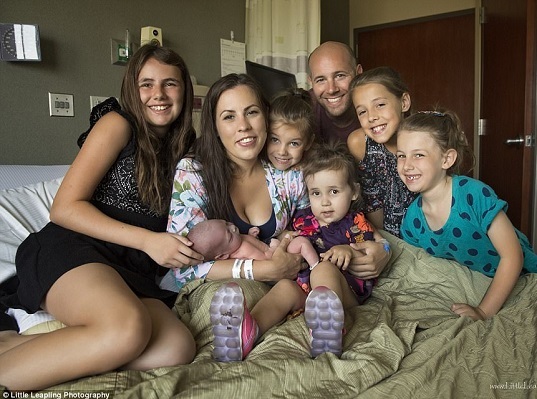 Sweet photos show Max's five sisters getting to know their newborn brother next to their proud parents.